We appreciate any and all links from your site to ours. If you'd like to receive community points for your links, please send us a note and include a link to the link. 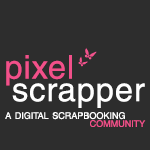 10 community points for a blog post that includes a link to Pixel Scrapper, or any link to a Pixel Scrapper sub-page. If you use a text link, we would appreciate if the text was "Pixel Scrapper Digital Scrapbooking" or else you can use one of the following buttons. If you are having trouble adding our buttons to your blogger blog, please see this detailed tutorial by Lórien.